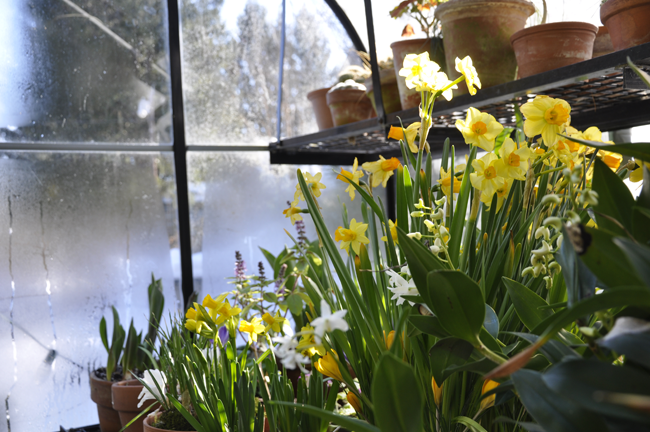 As the sun becomes warmer under glass, both spring forced bulbs and early blooming cool-loving orchids make a nice display in the greenhouse. 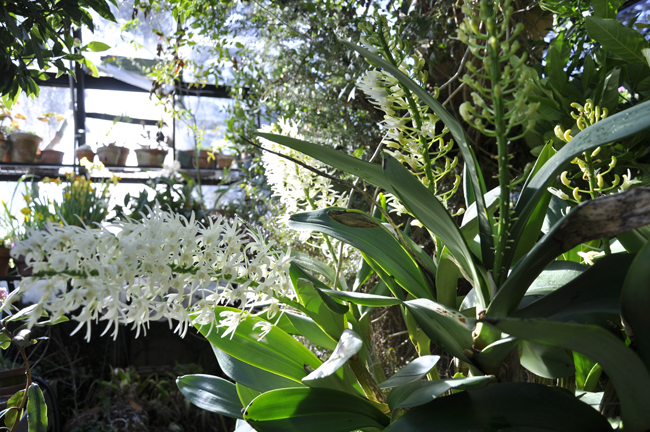 Note the Dendrobium kingianum on the right, a cold-loving Australian orchid. 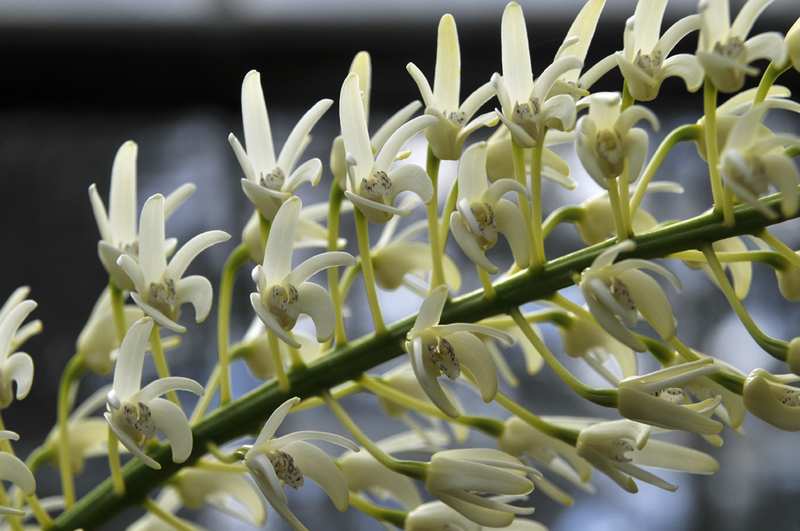 Of all the orchids in the genus Dendrobium, D. speciosum may just be the largest. This plant, in a 24" basket, now weighs nearly 60 lbs, and although hardly perfect, with some leaf burn, it is impressive with many, long spikes of flowers. It's so big, that it's difficult for me to photograph it. 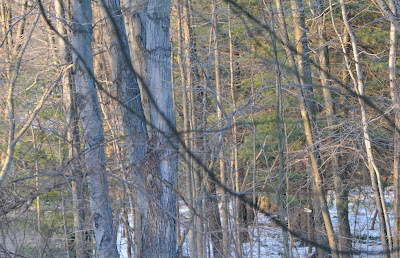 As many of us in Eastern North America discovered, this weekend in last February was our fist taste of spring, that is if you can call 48º F spring. 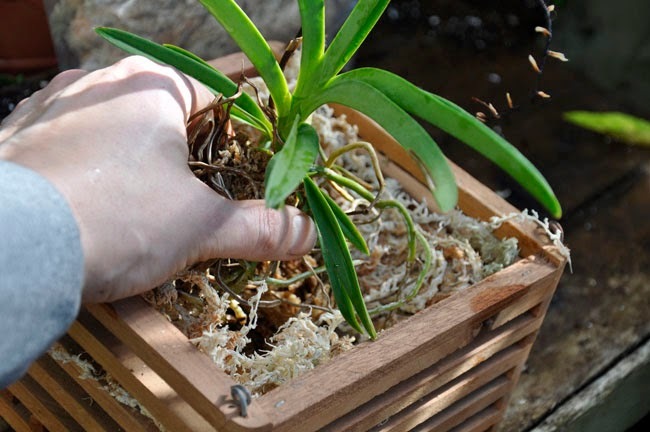 With temperatures rising above freezing, I decided to repot some orchids - a long overdue chore - is it OK to admit to you all that I only decided to do this because while looking for more bags of bird seed on the back porch, I found a big bag of orchid repotting supplies that I had completely forgotten about? 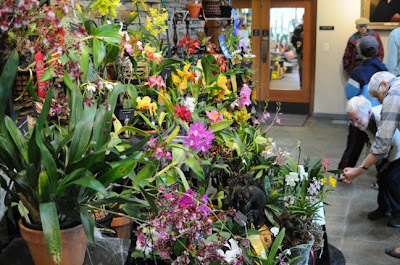 - with tshirt weather under glass, brilliant sunshine and only the sound of winter birds outside the glass, I could use some orchid-repotting therapy right now - especially after 4 snow storms in one week. I don't have the perfect greenhouse for raising many orchids, we keep a few in the house during the coldest months of December and January, with many occupying windowsills and plant windows, where they sit on gravel trays which provide some moisture, but most of these orchids are ordinary super-market purchases ( still beautiful, but not botanically interesting to folks like us). 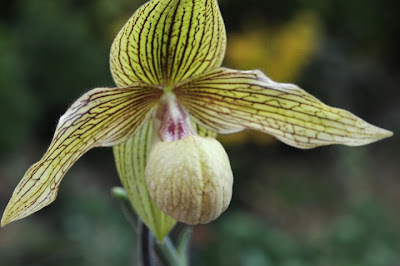 So although we keep these phalaeonopsis and paphiopedilum, the lady slipper orchids, warm and safe, as they like the same temperatures we do, and throughout the winter, they provide us with at least some hope that warmer weather will eventually return. 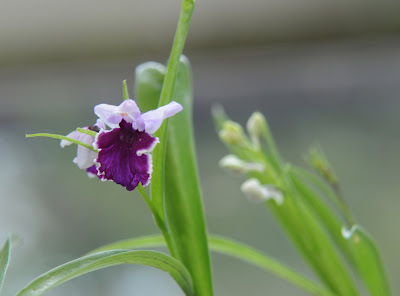 We can't grow all of the orchids, but I do keep a few selected rarer species - the real treasures, out in the greenhouse, where I am limited to those species that can handle the colder temperatures, of which, there are plenty. 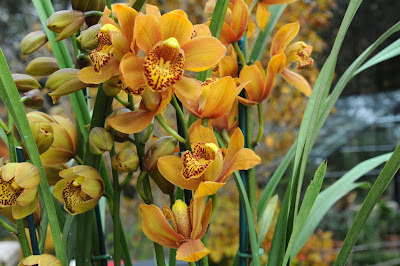 Cymbidium orchids have been bred into thousands selections, which thousands of named crosses now available. Most are cool to cold loving plants, and will thrive in a cool greenhouse in the north, or outdoors on terraces and in containers in areas that do not freeze, such as Northern California. This selection was bred in Massachusetts, and it is called 'Bay State'. I leave plants outdoors until a hard frost hits, and I bring it in just before it freezes, which stimulates it to form spikes. 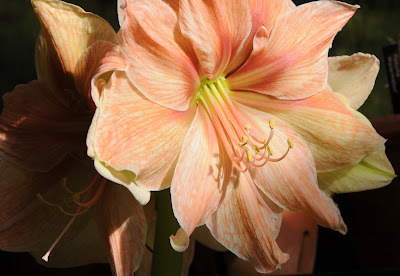 There are cymbidums to please most every taste, and varieties that will bloom in most every month. You may think that all orchids need tropical rainforest conditions, but that's just not true, as there are many which prefer cool or cold winter temperatures, and even some which can handle very light frosts.Orchid collectors divide the great orchid family (one of the largest plant families in the world) into three broad groups, based on cultural conditions - cool growing, intermediate and warm. 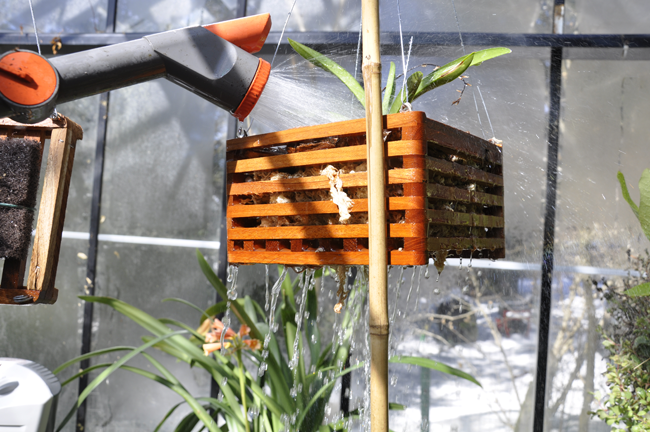 Cool growing orchids (those which perform best with some periods of either near freezing or night time temperatures around 40º are best for us, while we find some success with intermediate orchids, which often can handle temperatures around 50º at night. 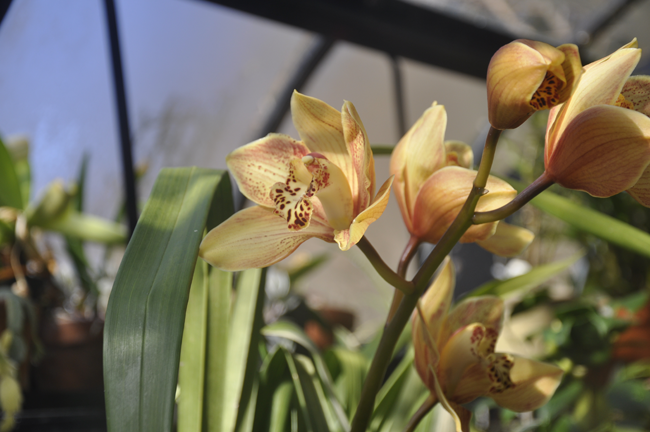 Warmer orchids are not growable, as they mostly demand hot and steamy conditions, and cannot tolerate temperature swings often preferring constant temperatures above 70ºF. This Dendrobium aggregatum, a miniature creeping dendrobium likes to grow on a slab of tree fern bark. I purchased this young plant in a pot, but I am repotting it to grow as a 'slab' orchid. 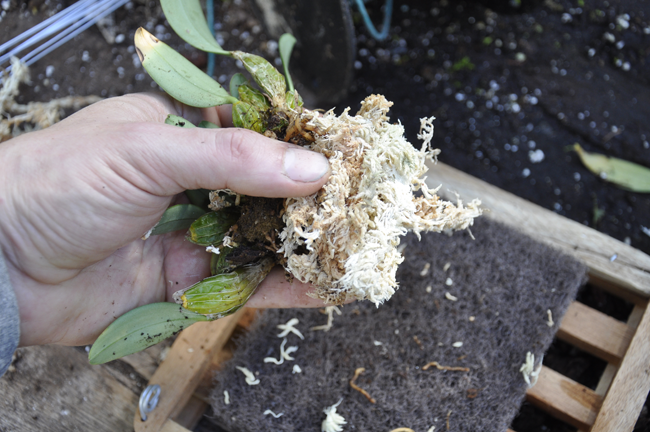 I first remove the old growing bark, wash the roots carefully, wrap them in long fiber sphagnum moss which was soaked in warm water, and then wired the entire plant to a square block of tree fern bark. I a few years, it will completely cover this slab, when it blooms in the spring. 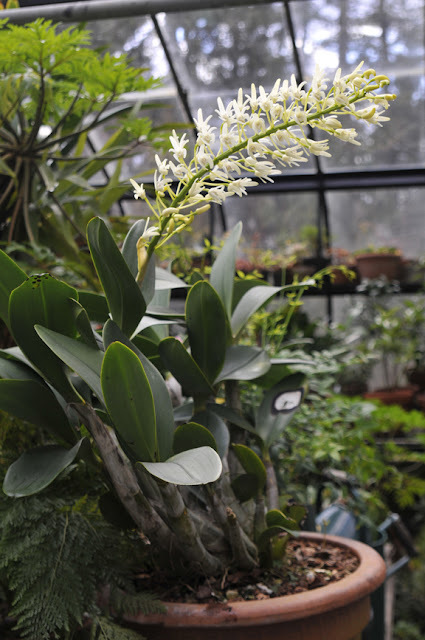 Even in a cold to cool greenhouse in New England, there are many orchids that thrive in this atmosphere. 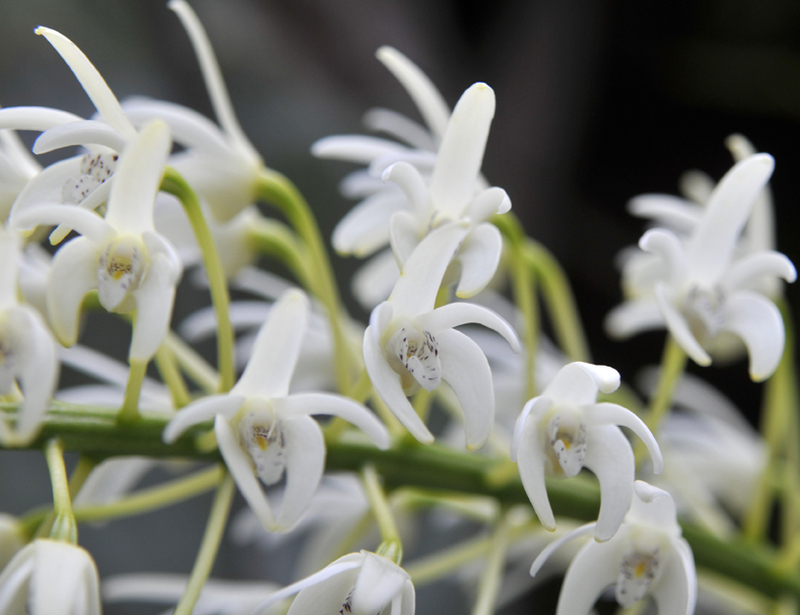 Many are in the Dendrobium clan, but note, not all dendrobiums like cool temperatures, as the genus is large, and has species that live across the temperature spectrum. 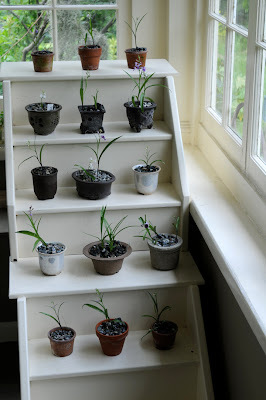 With orchids, it's generally elevation that dictates what conditions they prefer. If you think of Borneo for instance, you may imagine steamy, tropical jungles, but there are mountainous areas that reach near to the snow line, and there are orchids at most every level. Mostly, I grow Australian dendrobiums, or those from higher elevations in Asia. 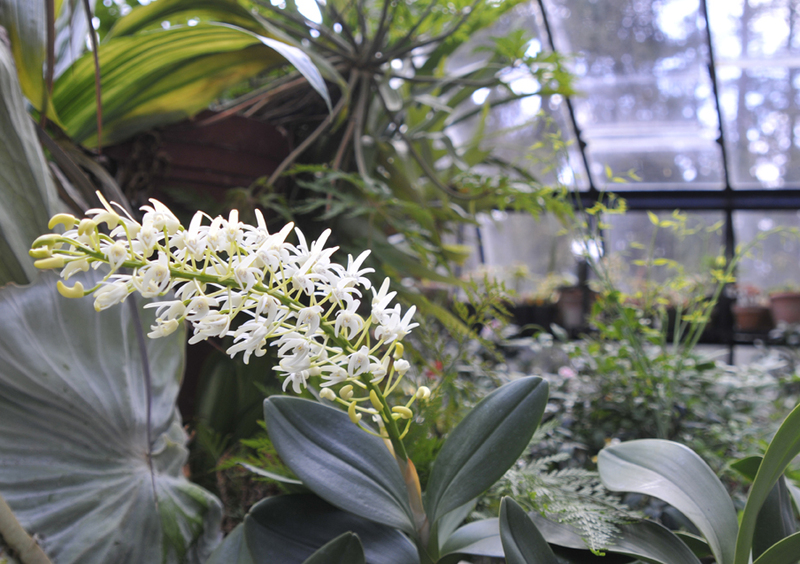 A young Dendrobium aggregatum freshly wired to a slab, and soaked for an hour, enjoys some mid-winter sunshine in the greenhouse where the snow is nearly 3 feet deep just pass the glass wall. 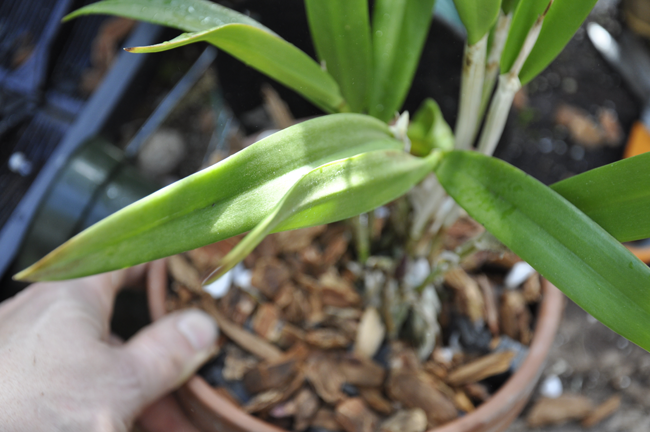 A Brassio Cattleya cross, is growing out of its container. It's clearly time for repotting before it sends out new growth which will bloom next autumn. 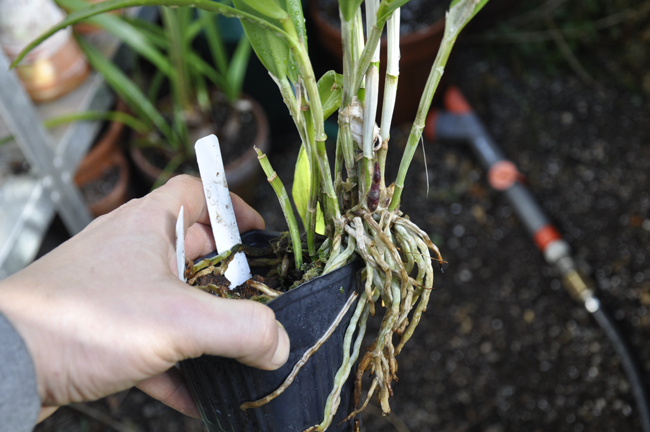 One must be careful in removing a plant like this from a pot, as you will need to be careful not to damage the newer, white roots, which adhere themselves to most any container. This plant I potted in a clay orchid pot, which I will hang from the rafters with clips. 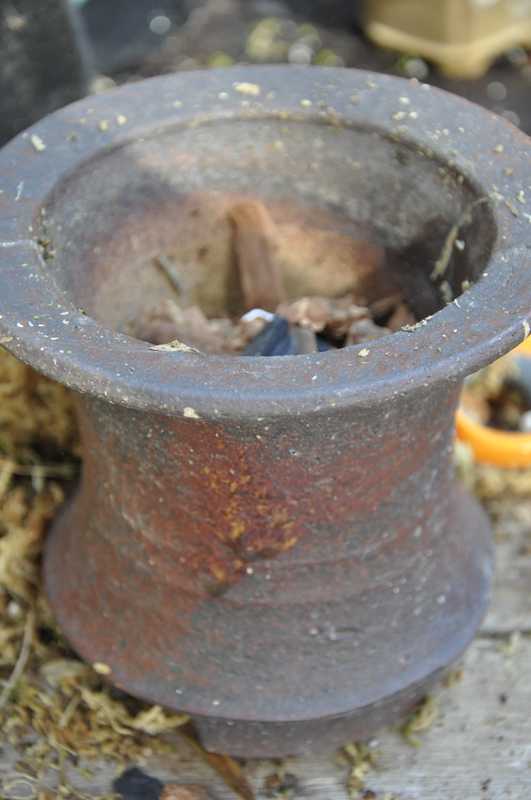 It is centered in the pot, and sits at the same level as it sat before. Epiphytic ( growing on tree branches) this orchid like most, needs perfect drainage. 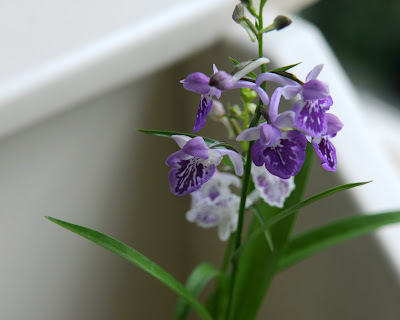 This is a cross between a Neofinetia falcata orchid, and a Vanda. Both species are related, so this is not an odd cross. 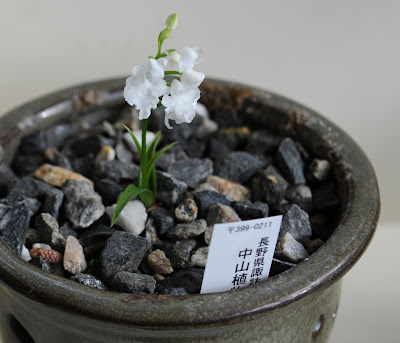 It should produce flowers larger than the traditions Japanese Neofinetia's which one sees in so many Japanese plant collections, but with the size and perhaps color of the vanda clan. This is a genus that liked to grow in an airy mix, and although I could grow it in a pot, I have decided to pot this up in a wooden slat basket. 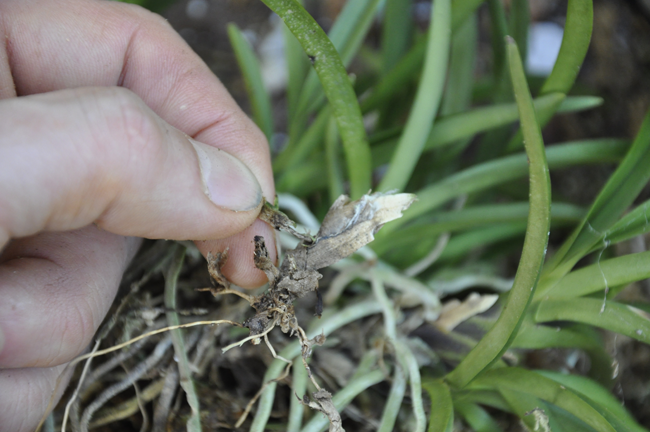 I place the Neofinetia Vanda cross in the bed of Sphagnum, and then use a good quality orchid bark mix to fill in around the roots. A bit more sphagnum, and I am done. Once repotted, this neofinetia Vanda cross is well watered. 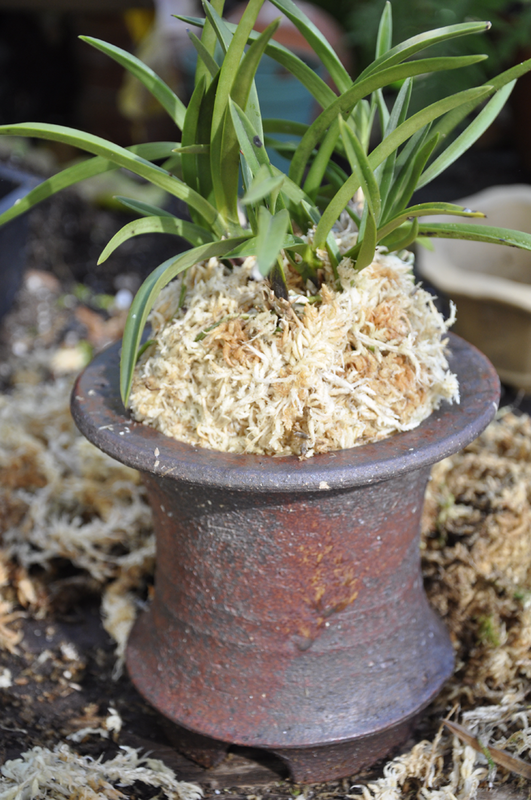 I am using a traditional Japanese container for one of my Neofinetia orchids, preferring to pot it in the traditional Shogunbutsu method, where the plant is placed on a mound of sphagnum. 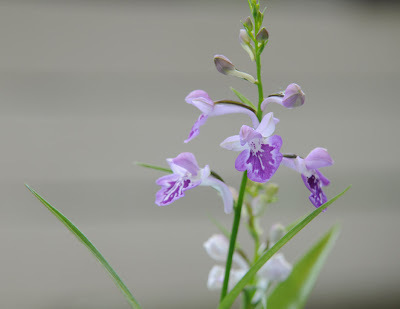 In Japan, many orchids are grown in this way, and most are native Japanese orchids, which were so popular during the Edo period, and said to be raised by the Shogun. 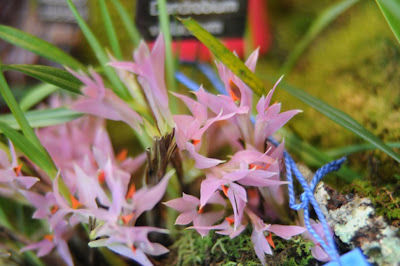 Check these amazing images out of an orchid show in Japan. I try to grow them like this, but not nearly as nice. 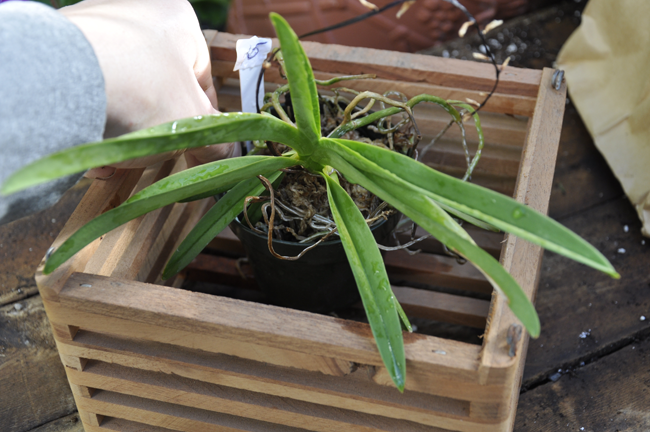 While repotting my Neofinetia falcata, I need to do some housekeeping, as I had been slacking. 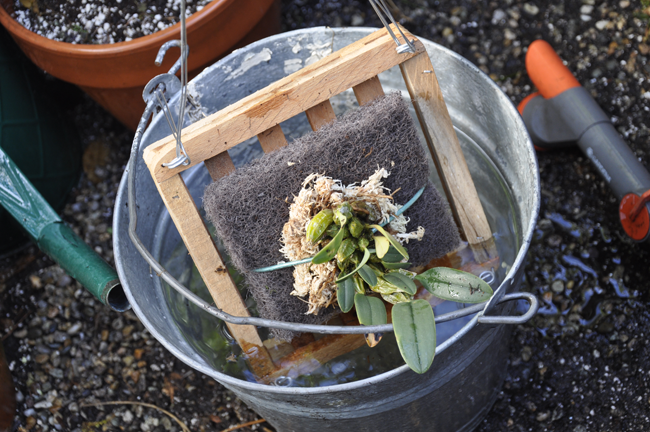 Old fans which had died, needed to be removed, as well as dead roots, and dead flower stems, This is a genus that like to form clumps, and it makes a better specimen plant if allowed to grow large, but to get them to any size, one must keep the plants clean. I could have divided the plant also, but decided not to. Now repotted with a nice, clean mound of sphagnum, is still looks nothing like the specimens one sees in Japan, where this orchid had a strong, passionate following. Here is what it will look like when it blooms for me, in August. Dendrobium speciosum, another view, as the sun begins to set. 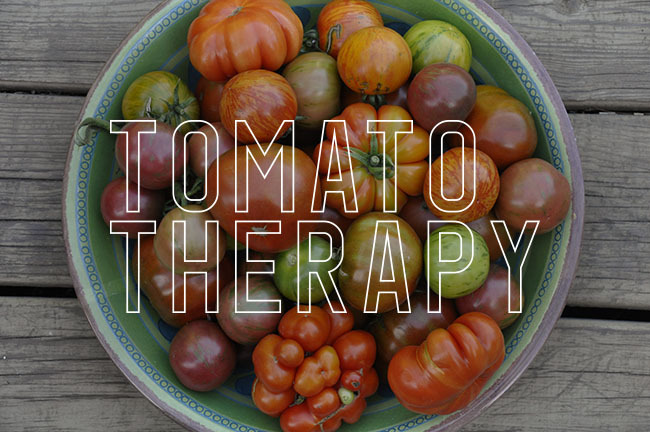 One last thing, if you've bothered to read this far.....The folks at Better Homes & Gardens have nominated this blog as a top Garden Blog ( there are currently five) and they are asking my readers to please vote for which gardening blog they feel is the best from this list of 5. A bit of a popularity poll, I guess. Please vote for any of us, by clicking this link - and note that it will ask you to share your vote on Facebook, but you don't need to, your vote was already automatically counted. Thanks! 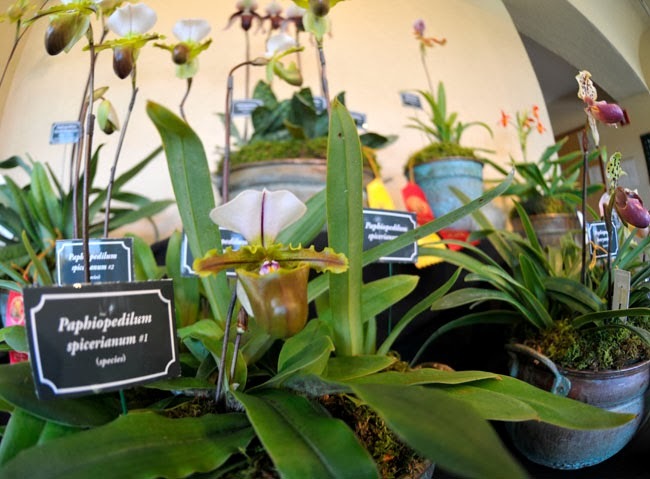 This weekend Joe and I attended the Massachusetts Orchid Society's annual orchid show, held at Tower Hill Botanic Garden in Boylston, MA. 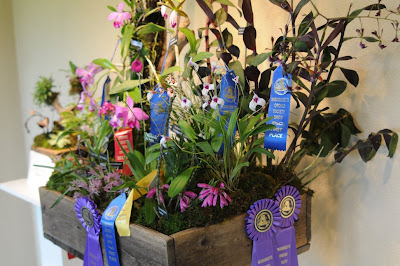 Sponsored by the Massachusetts Orchid Society, it's a popular show ( as orchid shows tend to be), and it is show that we have attended many times, even thought it falls just as we are trying to pack our own greenhouse for the winter ( or fixing glass which broke during a windstorm this week! 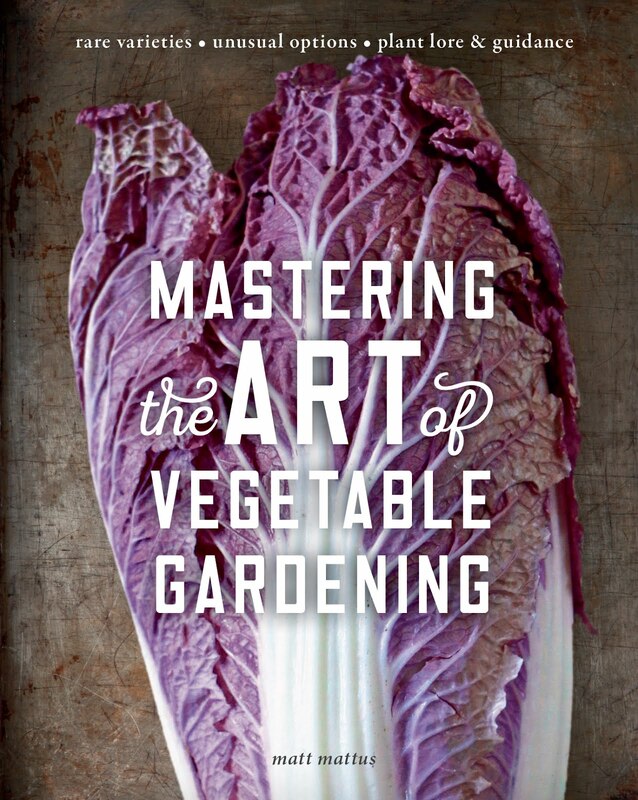 ), or when we are busiest with fall garden clean up like raking leaves. That said, there is ALWAYS time to go look at orchids, and to buy new ones. I mean, mini-complex Paph's - Where have you been all of my life? Even though it may seem that orchids are everywhere now, the real serious orchid grower remains a rare commodity, yet I warn you novices with your ice-cube orchids - before long, you will yern for something more, and you will move onto a dyed blue orchid - and then you might try just one cattleya, and before long, you are in rehab. 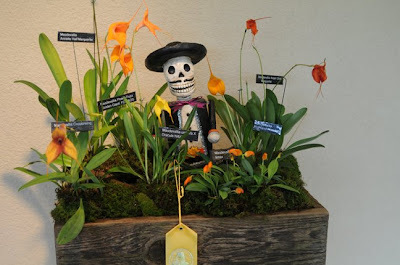 Don't 'Do' Orchids. They are addictive and hard to get off of. Don't say that I didn't warn you. 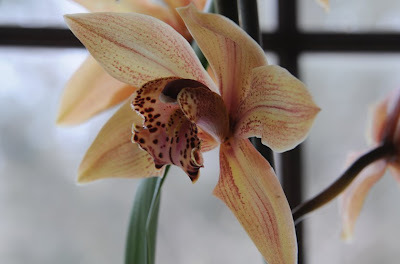 It has been said that the 'orchid collector' may be the most obsessed ( i.e. crazy, as in "they will kill someone for a rare orchid - read any book on orchid collecting and see!) of all enthusiasts, perhaps only to be outdone by dog-show people ( or is it the other way around?) Either way, we are doomed. I've been trying to stay away from anything orchid related for some time now, I ignore invitations to join local chapters of the AOS ( the American Orchid Society), if I accidentally click on a link to the AOS website, or to one of the hundreds of orchid grower sites that I have bookmarked for that day when I win Megabucks ( like Santa Barbara Orchid Estate), then I just as quickly hit the back space arrow. No orchids, not for me. Not yet. Must focus, must focus, must focus and resist. Pleurathalis species which displays it's tiny blossoms within its leaf. 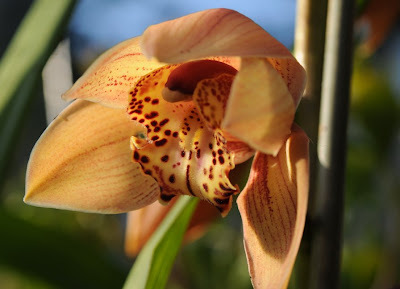 Not all orchids are showy, many are odd, and may seem very-un-orchid like at all, yet most orchids are not what you think. I admit that I grow many, MANY plants, but orchids? As some of you know. 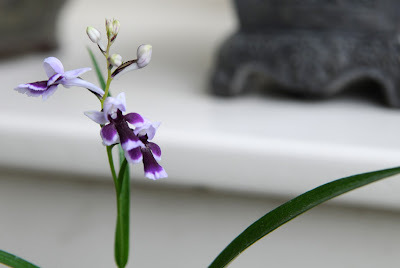 I do grow a few orchids, mostly hardier forms dendrobiums, some of the cool growing Asian Cymbidiums and the Japanese forms of Neofinetia - those tiny, fragrant summer blooming orchids. 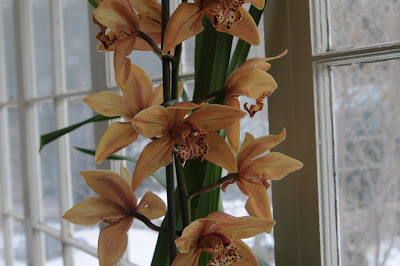 I do show great restraint with orchids, often getting board with fancier forms, and I show signs of being tempted with all but the rarest forms of many species, yet luckily, I cannot legally obtain them nor afford them (yet). And so it goes with orchids. The height of plant geekdom. 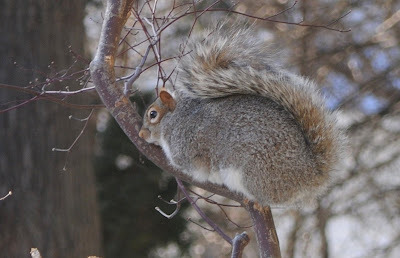 Luckily, I cannot afford the warm, humid, water-filtered, air-misted closud forest stove which many of the finest species demand, so I am left with the odd balls. Those species that can handle the cooler, and more seasonal shifting temperatures of my greenhouse, - oh yeah, and those that can handle some negligence. I am not about to buyt a $700 water filter which most collectors have. ( true). That said, I am still a plant collector....and therefore, I lust. Dendrobium speciosum, an impressive specimen plant even with one spike in bloom. This magnificent orchid plant, a true giant in the broad genus of Dendrobium, is native to Australia where is grows on protected cliffs in New South Wales. 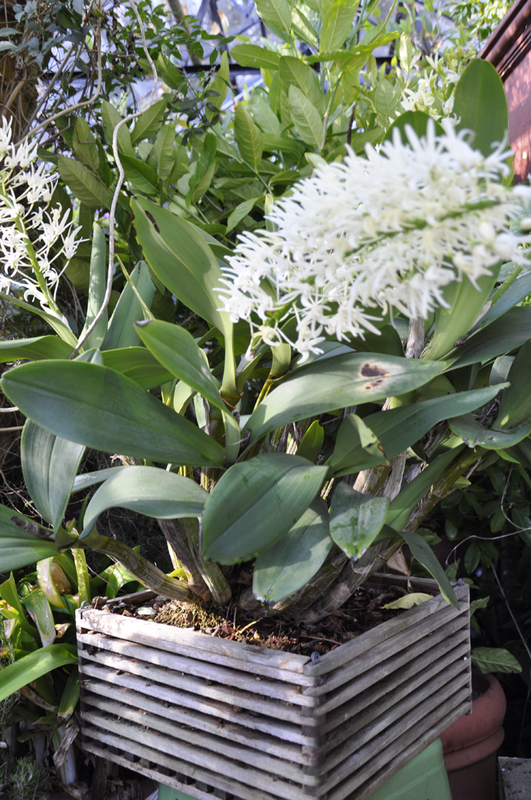 Indeed, it is one of the largest in the genus Dendrobium which limits who can grow it, for this is a plant that needs room, cold temperatures and muscles, if you ever plan to move it. Dendrobium is a genus which many of us are far too familiar with ( think - hardware store orchids in poly bags), but this species is hardly common, for it is a giant wild form which is rather uncommon in the trade and thusy, in collections for many reasons, one of which is its massive size. A mature specimen plant can be 5 feet in diameter or more when in bloom, barely small enough to fit through a door. 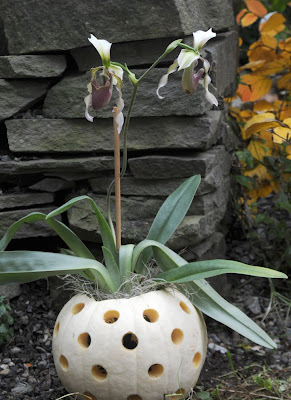 Match that with 3 inch thick pseudobulbs and the weight alone limits who can grow it. I first saw this species while on a research trip to Japan two years ago, while there, I visited the Tokyo Grand Prix Orchid Show in February where I saw a huge specimen of this Dendrobium, and once back in my hotel room, I immediately started looking for a source, which was more difficult than I thought it would be ( I finally found this plant above, at the Santa Barbara Orchid Estate). I quickly ordered a plant via their website, without thinking about the size. When the UPS man delivered a four foot tall box, I started to realize what I was in for. Inside, the 5 gallon pot held a nearly mature specimen, but one that still needed a year or two under careful culture before it would bloom. Dendrobium speciosum is considered a cool-grower, and it will do find in a greenhouse like ours, where winter temperatures are maintained around 40 degrees F. This plant spends the summer outdoors, where it receives fresh rainwater which is essential for most orchids, as well as a light dose of liquid fertilizer every two weeks. 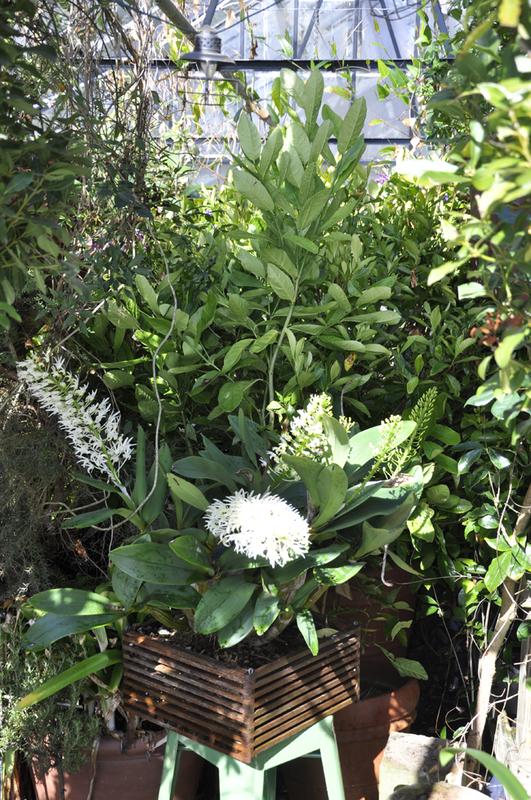 The plant lives in a large terra cotta pot in a wood bark mix ( Aussie Gold) which is refreshed annually. As many of you know, I am not an orchid grower, and the few plants that I do keep are sturdy, and not considered fussy by any means. 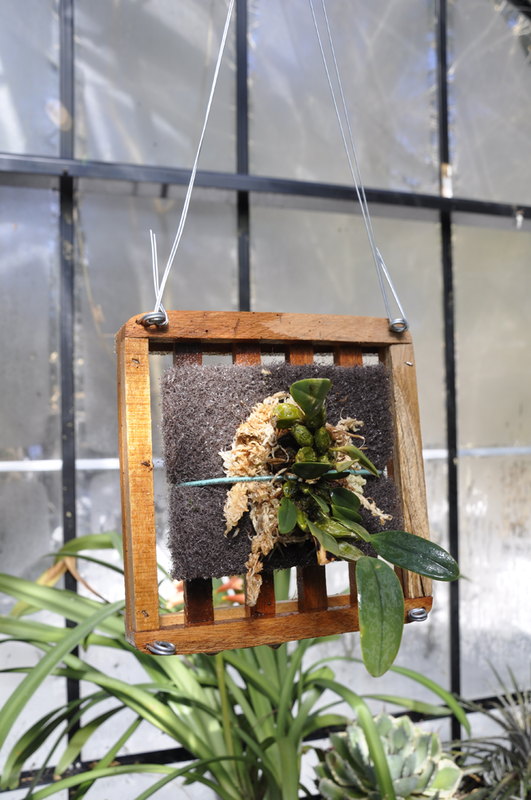 What they do share in common is limited to the temperature range, for the cool to cold climate of my greenhouse limits what orchids I can grow well. 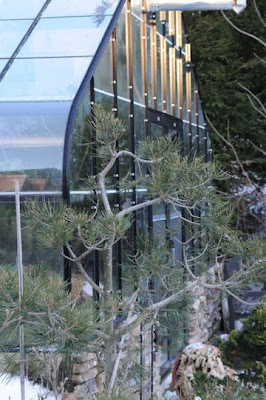 Some recent images from last week, in the greenhouse. 'Tis orchid season. Autumn may mean fall leaves, but this time of transition, not unlike spring, which is what it is in the other half of the world, autumn means orchids. A slightly deformed flower ( one half is actually missing, but when shot at this angle, you cannot see it).Something must have happened to the flower bud while in spike. Still, this new cross was appealing to me last year, when I purchased the plant at the New England Orchid Society Show since I felt that this Paph looked at bit like our native pink Ladyslipper, Cypripedium acaulis. Ladyslipper orchids, you will find, generally fall into three genus ( Which, for those of yer intimidated by orchids, is the first name in the latin name which is capitalized, the species half, is always lower case. The cross, or the name that the breeder has given the cross, will be in parenthesis). 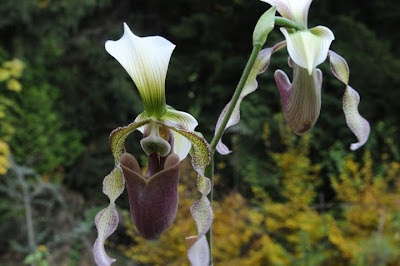 The three genus commonly referred to as ladyslippers are Paphiopedilum ( Paph's for short, in case you search for them on eBay, these are usually topical or sub-tropipcal), Cypripedium, ( usually you can think of yellow or pink ladyslippers that are wildflowers in temperate climates, Cyp's are hardier slippers, such as those grown in the garden and woodland in North America) and then there are the last tropical forms, known as Phrag's or Phragmapedium, similar to Paphs, but usually with more flowers per stem, and some and very long petalstha twist and hang, downwards. 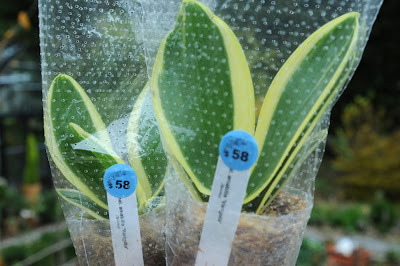 eBay is a great source for Paph's and Phrag's, if you want to load your windowsill up for the winter. Tropical Ladyslippers, like Paphiopedilum are highly collectable by orchid specialists, but I do wonder why they are not more commonly grown by ordinary folk, for these cool growers are as easy to grow as the more commonly available Moth Orchids, or Phalaenopsis one finds at home centers and florist shops. With around 20,000 species, Orchids are the largest Family in the plant kingdom, and still, we only can find less than 5 available at retail locations. 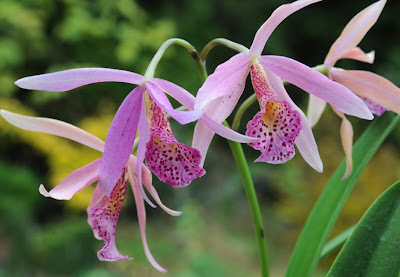 If I was to recomend easy orchids, especially to those in North America ( New England, in my case) I would suggest Cymbidiums, Paphiopedillums ( the Lady Slippers) and Miltonia species and the many hybrids of all of these. I have yet to be able to bloom a Phalaenopsis from Home Depot, however. Besides, they bore me. A Rain Lily, or Zepharanthes blooms in a pot on the deck. I move pots around all of the time, and the Rain Lilys, or Zepharanthes always surprise me. These ridiculously easy-to-grow bulbs were purchased 7 years ago, and I just keep them in the same pot, with hardly any care, besides the rain. They cannot freeze, so I keep the pots dry in the greenhouse all winter, and in the summer, I just place the pots outdoors, where the grassy foliage emerges early in the year. Every fall, the flowers surprise me since they emerge on an unpredictable schedule, usually after rain, the experts say, but I find that temperature and day length may play a more important role, since it has rained here ALL summer, and no blooms. As the pots bloom, I move them into arranged displays along with whatever plants in containers happen to look good at the moment. Here is a sampling I threw together last evening, with little thought. I think I could have found better companions to assemble together if I wasn't barefoot, but the gravel is sharp, and I was too lazy to go find sneakers. 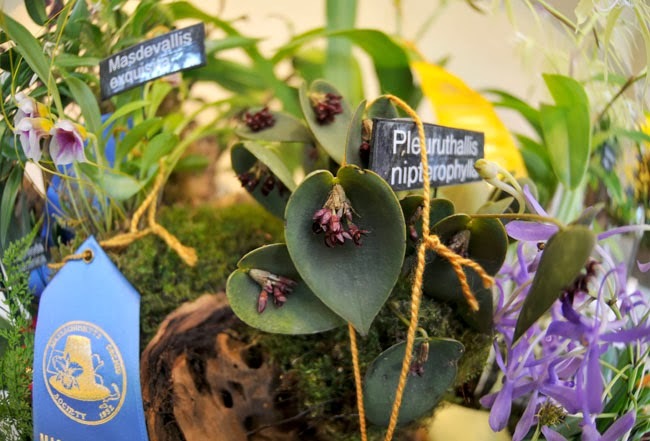 LAst weekend ( halloween weekend here), our local Orchid society held its annual show at the Tower Hill Botanic Garden in Boylston, Massachusetts, an hours drive from Boston. 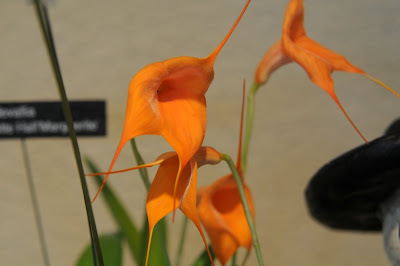 Many wonderful orchids were on display, and I was impressed with the quality and variety of species that were shown. 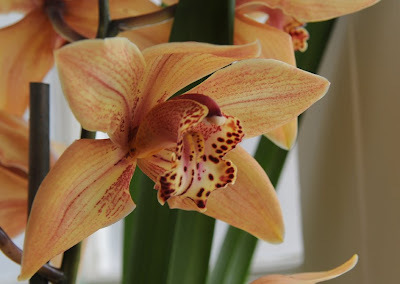 The Orchid Society is one group which I am not a member of, I think I passed through my 'orchid phase' a few years ago, but I encourage others to consider joining - this particular chapter is interesting because it meets on weeknights rather than on weekends, which fits my calendar more conveniently.